A bipartisan group of incoming members of Congress were given a security briefing by Israeli prime minister Benjamin Netanyahu during a trip to the Jewish state. Republican congressman-elect Denver Riggleman, an Air Force veteran, says the visit served as "Israeli history basic training." Riggleman, a Republican who ran against a vocal anti-Israel activist in Virginia's fifth district, says there's been a good balance to the information presented to the group thus far on the trip, which is sponsored by the American Israel Education Foundation (AIEF), an American Israel Public Affairs Committee (AIPAC)-affiliated nonprofit group. In addition to their briefing on security from Netanyahu, they met with Tzipi Livni, a prominent politician who leads the opposition party in the Knesset. The group also traveled to the West Bank city of Ramallah to meet with Saeb Erekat, a top Palestinian official. "They are directing us to learn in a nonjudgmental way," Riggleman said during a phone call from Tel Aviv. "It's been fantastic to hear from people who will forget more about Israel in a day than most Americans will know in a lifetime." Riggleman, a military veteran who visited Israel once before during an Air Force operation, says all the meetings have been for educational purposes only and declined to quote any of the briefings. He said the meetings have all centered on the peace negotiations and all possible outcomes. 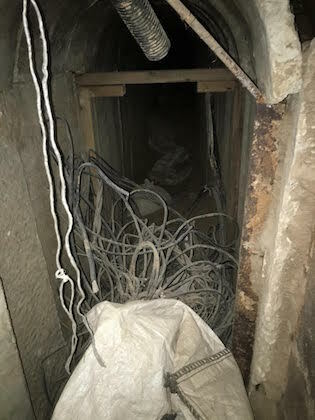 The group is also getting an on-the-ground lesson on the challenge of keeping Israel safe, going inside tunnels built by Palestinian terrorist group Hamas. It is also being shown the difficulty of defending the northern border, where three tunnels built by terrorist group Hezbollah have been discovered in recent days. Riggleman says he's been struck by the operational challenges Israel faces from nearby foes, even as it deals with threats to its existence from Iran. "When you look at the distances they deal with, you have to be very impressed with the Israeli people," he said. "Everything is so close here. They're worried about ISIS and the Gaza Strip, but at the same time they have a priority towards Iran. Iran is the priority in Israeli foreign policy." The trip comes as other members of the incoming class of Congress reject the idea of traveling to Israel, with Jewish Insider reporting that Democrat Alexandria Ocasio-Cortez will not join either AIPAC's trip or one sponsored by J Street, a far-left group that also brings members to Israel. Fellow Democrat Rashida Tlaib, who supports the economic boycott of Israel, plans to lead a congressional delegation on a trip to the West Bank, attacking the AIPAC-sponsored trips as "one-sided." Riggleman chose not to criticize any of his future colleagues by name. He recounted advice given to him during his military years to explain, however, why he thought his colleagues were taking the wrong approach. "When you get a new assignment, the best thing to do is keep your mouth shut for three months and learn first before you open," Riggleman said. "I believe you need to be educated about the conflict and the possible solutions before you comment. Our responsibility is to learn first." "Once you're here, and you hear both sides like we have, you get an understanding of the complexity of this problem," he said. "It's not just as simple as identifying one group and leaving them out of the conversation, that defeats the purpose of being in Congress in the first place." "I find it amazing that those elected to office, instead of exercising their right to educate themselves on the issues, would speak first and find out more later." He said he thinks the AIEF trip is a productive way to stem growing anti-Israel sentiment in politics. "Some of us ran against candidates that were decidedly anti-Israel, I certainly did, and there is a fear of this far-left faction of anti-Israel sentiment," Riggleman said. "What they're doing is educating both sides, to make sure that there's an educated discussion on the issue." 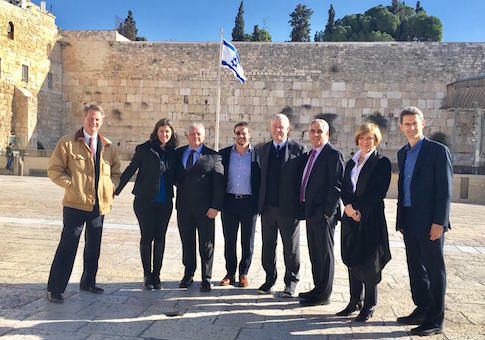 Joining Riggleman in Israel are Republicans Dan Crenshaw and Tim Burchett and Democrats David Trone, Susie Lee, and Elaine Luria, a fellow Virginian. Riggleman said all five of his colleagues chosen by AIEF to join him on the trip have impressed him. "All six of us have common sense, and backgrounds that allow us to understand the subtleties of the situation," he said, expressing hope that the group could be part of a "bipartisan future" in the House. "Who knows, once we're all sworn in this may turn back into a partisan battle, but I think the Israel issue needs a tremendous amount of bipartisanship," Riggleman said. This entry was posted in Politics and tagged Benjamin Netanyahu, Hamas, Israel. Bookmark the permalink.